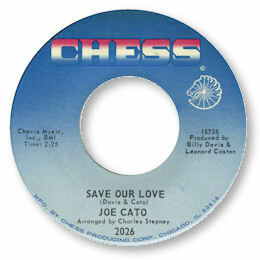 The only known release by Joe Cato features this tuneful beat ballad Save Our Love. His high baritone voice soars above the huge orchestral backing to great dramatic effect – he isn’t swamped at all. This is a good job really as so often in this type of uptown music the vocals get lost in all the waves of sound coming from the rhythm, horns and strings and the soul of it all just gets blown away. Not in this case.